Absolutely great chase day for our first day. We started in DFW & I had a prelimary chase target of between Sulphur Springs and Mount Pleasant in NE Texas. This would put us firmly in the warm sector and in the best area for rotating storms. At 6pm things were not looking great but a few cells fired south of us near Tyler and a massive hailstorm near Dallas. I chose to go for the cell to our SSW Which was in the much better environment for Tornadoes, on route to the storm a Tornado watch was issued and our now supercell was strengthening. Upon getting to Gilmore we went west to intercept the NE Moving Storm about 15 miles further down Highway 49. Then took a SW Option to run along the SE Quadrant of the Storm. The terrain was shocking with Pine Trees and few views, so we needed a bit of luck. I got to a crossroads and blasted back North and finally a better view to our South west came. The Supercell now did a hard right turn throwing its forward flank behind us and leaving us perfectly in the Hook for about 20 minutes. We started to take sporadic Golfball sized hail and an amazing Bears Cage rained down Cg Bolts on the road in front of us. At this time the rotation was becoming crazy with a solid wall cloud about 2 miles to our West. Numerous Funnel clouds came down and rapid rising motion behind a row of trees looked like a Multi Vortex was on the ground although we could not confirm at the time, wrapping rain curtains were moving from SW To NE At high speed. 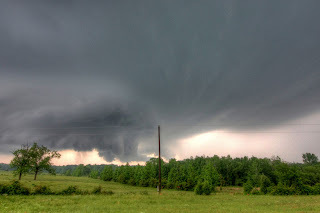 I positioned us further South and again rapid rotation was literally on the road in front of us. By now darkness was starting to fall so Lightning became the our main goal.....or so we thought. Upon racing back east and then North we came along highway 281 and had a close shave with the Hughes Springs Tornado which crossed our road about 300 yds in front of us bending trees over and sending horizontal rain across the road, we fled south and got hit by the RFD, The tornado continued east and hit Hughes Springs and Dangerfield. 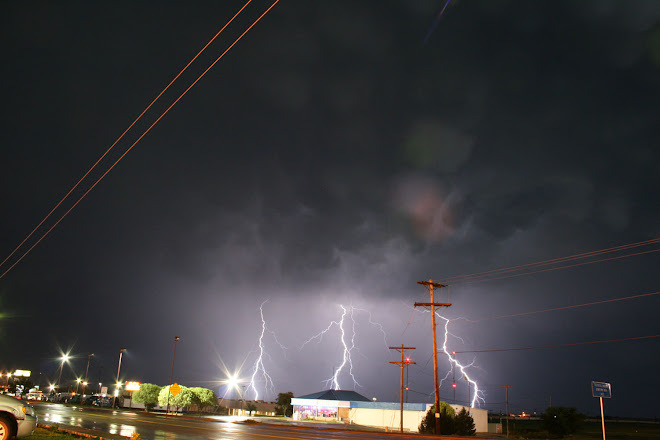 We then blasted up the west side of the cell with the Tornado to our east and upon entering Pittsburg we got attacked by another New Cell which started raining down Cg's on us, getting stuck at Traffic lights was not a good option Lol. We then moved east to stay at Texarkana for the night with some very happy people.